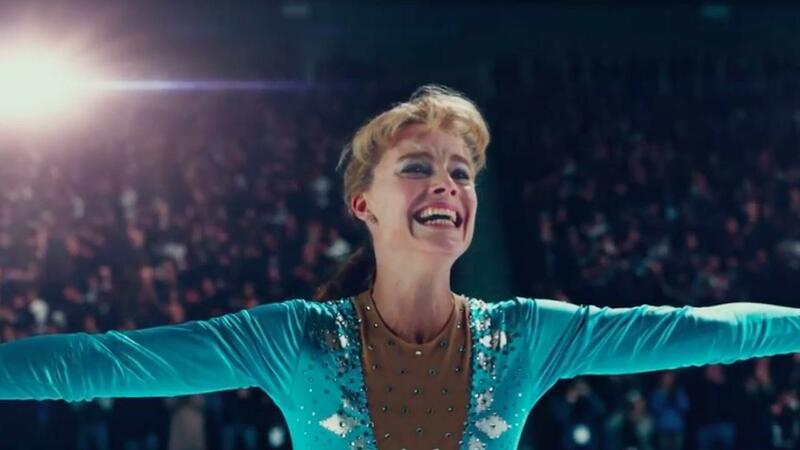 Beneath this energy, which is spear-headed by dark comedy, is a surprising amount of empathy that the film drums up around the figure of Tonya Harding (portrayed here by Margot Robbie). The highly publicized story of Harding plays out in the film in a semi-mockumentary, fourth wall-breaking style. Through this lens, the film becomes a reality-bending mix of multiple subjective viewpoints. This is a fantastical way to present the story, and it does wonders for pacing. All the same, one of the talking heads in this mockumentary footage—Bobby Cannavale’s reporter character—is an unnecessary cog. Perhaps his interview scene with Harding’s husband Jeff Gillooly (Sebastian Stan) was cut. Minor observation; let’s continue. Robbie sells us Tonya Harding by giving us, perhaps, her best acting performance to date. Sure, she is the crass, self-proclaimed redneck that you see in the film’s trailer, but she also gives us a surprising amount of access into Harding through tapping into an internal emotional state that seems entirely plausible for that character. Robbie delivers a consistently stellar performance throughout the film, but one need only look at two scenes to find hard evidence of her abilities in this role. One is a closeup of her putting on makeup before a competition. The other: a scene in a courtroom at the back-end of the film. Much has been said of Frances McDormand’s performance in Three Billboards Outside Ebbing, Missouri, but Robbie gives her a run for her money for best performance from a lead actress in 2017. Alongside Robbie is Allison Janney, who portrays Harding’s mother with a curt ferocity that is transfixing. Them together on screen make for some of the most electric acting of 2017. One exception here is their last scene on-screen together, which plays out loosely in the otherwise tightly-plotted film. Not to mention that Janney’s character in this instance seems to be working in complete contrast to the singular motivation that has driven her through the rest of the film. Just a tiny thing; shall we go on? Tonally, this film controls dark comedy and bitter drama in a way that is fascinating. This film depicts domestic abuse almost constantly, but it does so with a retrospective narration that gets away with making it appear, at times, as part of a joke. It never makes light of such a disturbing way of life, but it grounds it in the world of this character in such a way that making light of certain instances is justified. A large part of this tonal control comes in the form of fourth-wall breaking. Characters will at times interrupt the flow of the narration in order to comment on a part of the story in which they dispute the veracity. At first, this is gleefully unexpected. Over time, though, it becomes a tad repetitive. Merely a tad; what’s next? The actual depiction of ice skating in I, Tonya is shockingly well-done. If one is watching with any intent they will see the augmentation of special effects used to nail the triple axle or integrate Robbie’s face into the routine. Still, the way the camera keeps everything in frame—dynamically, too—while this effect work is being staged is impressive. DP Nicolas Karakatsanis and editor Tatiana S. Riegel, I tip my cap. I, Tonya is an astonishing film. It may not be receiving the same amount of buzz in the award circuit as The Post or Lady Bird or The Shape of Water, etc. etc., but it is just as pleasing of a watch as these films are. The film didn’t come out in my area before I made my best of the year list, but rest assured that it would have broken the top 10.